Recently in the-vu we reviewed the Zumaround Zum electric scooter and consequently we recently received a press release for a new German design, still in it’s capital crowdsourcing stage. The prototype Skujou Cruise looks great and the specs are excellent, so we introduce it here, although you cannot buy one just yet. Like myself, the founder Tarek Garir was a scooter lover as a child and that appreciation stayed with him as an adult, and fueled his passion for this venture. At time of writing, just one prototype exists but Tarek says that in the “mid-term” they plan to export to the EU and to the USA. 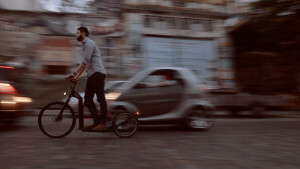 Legally, in Europe, the Skujou will be classified as a moped/electric non-pedalec bike and can only be ridden on the street. Production will be in Germany, not China, and if the Kickstarter funding is successful an initial run of 25 to 35 units is planned. They are making efforts to market the image. Using the prototype they are demonstrating what I already know, an electric stand-up scooter makes so much more sense than an e-Bike. There is no need for seat, pedals, chain, gears, derailleurs and all that complicated and uncomfortable bicycle nonsense. Once you have a motor you can throw all those ideas in the garbage. The Zum is an existing kick scooter (a Sidewalker Willy) with a hub motor kit added, whereas the the Skujou is designed as an electric. The Skujou has a larger front wheel, 26” as opposed to 20”. Both top out at approximately 19 MPH. There will always be a slight variance from scooter to scooter, with some going a bit faster than others. My Zum seems to go just over 21 MPH. The Zum can usually go considerably further than the promised 20 mile range when ridden at well below maximum speed. The Skujou promises 13 miles, but that is usually far enough. The Zum’s 250 watt 36 volt motor is in the front hub, for simplicity, the Skujou’s 350 watt 36 volt motor is in it’s rear hub. 350 watts will be better on hills! The Skujou has a kinetic energy recovery system, whereas the Zum relies instead on it’s long frictionless glides to extend it’s range. The Zum weighs 36 lbs and the Skujou weighs 33 lbs. The Skujou’s brakes are hydraulic. The Zum’s brakes are just mechanical bicycle brakes but they seem to stop it very efficiently anyway. 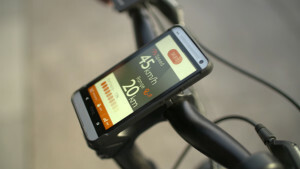 The Skujou has more smart features, specifically a smartphone app which provides ride data via your smartphone and a smart lock system controlled via the phone. The Zum has none of that. At time of writing the Zumaround Zum is available in the USA for $1250 USD including shipping. The estimated pricing for the Skujou, if it makes it, will be €1899 ($2091 USD), but early Kickstart investors are promised one for €1299 ($1430 USD). Shipping to the USA would be extra and there could be considerable taxes and duties. The Skujou appears to be a very high-quality and well designed electric vehicle. I hope it will be a success in this very difficult market segment. For more electric stand-up scooter news, follow this forum at Let’s Kick Scoot. Writer Jeffrey the Barak is half-man, half-scooter. I had a Honda Step Through 90CC “scooter” numerous years ago and I believe it had 16″ wheels. (You can see them on a Google image search – mine was red.) An image search for “motor scooters” shows more recent styles (like you see all over Paris). Soooooooo, I’m thinking that perhaps a smaller battery operated scooter vehicle might be more appropriate for sidewalk use. If I gotta ride in the road with a battery operated scooter, I guess I’d opt for a much heavier vehicle that could keep up with traffic and not run out of juice. The Kleefer and the Oxelo batter operated scooters seem more reasonable for city travel (on good pavement). The Oxelo probably has some shock absorption ability like its kick scooter brothers (the Kleefer probably does not). Your thoughts on the the size of the vehicles you’re reporting on with respect to city sidewalks or roadways? These scooters are too fast and too big for public sidewalks unless you cruise very slowly at the pace of a fast walk, which of course is quite possible to do. They might hurt an unpredictable pedestrian if ridden at running speed or faster. They are great on bike paths, but in many countries they are not officially allowed on bike paths and so have to go on the road with the motor vehicles. In my opinion, once you get up to 10 MPH and beyond, small urethane wheels are too dangerous. Larger rubber tires are absolutely necessary for safety and control.